Sparks Auctions is thrilled to announce the Prices Realized for the Gems From The Outaouais Collection. 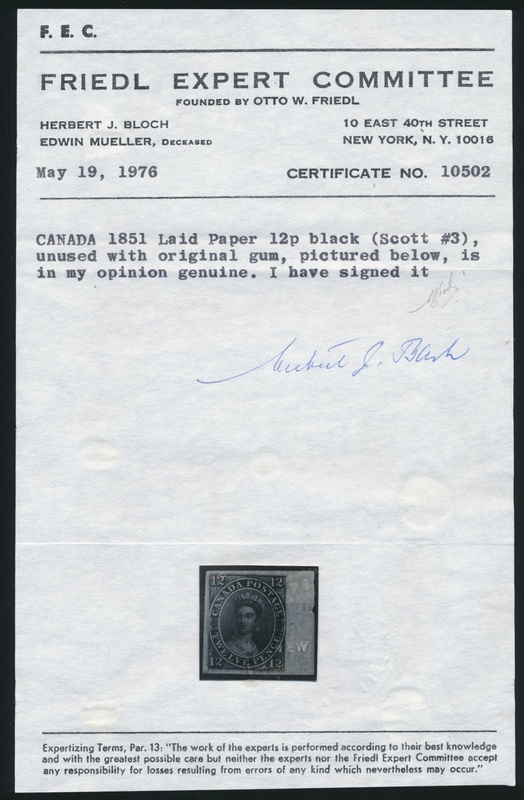 Each result is a Canadian auction record for that stamp, with the twelve penny black achieving the highest realization ever in Canada: $327,750 with 15% buyer’s premium included. Each of the designs of Canada’s first three stamps also established a philatelic first: the first land animal, the first appearance of Prince Albert, and the first use of the Alfred Chalon portrait of Queen Victoria. All three stamps were engraved by Alfred Jones and printed by Rawdon, Wright, Hatch and Edson of New York. The paper was supplied by Ivy Mills of Chester, Pennsylvania and was hand-made varying in thickness from very thin to somewhat stout. The laid lines range from easily seen to virtually invisible. However, characteristics of the Ivy Mills paper allow one to distinguish the early laid papers with no visible laid lines from the later wove papers. The scarcity of the twelve penny black is an oft-told tale. 51,000 were printed but lack of demand meant only 1510 were distributed to Post Offices and of these at least 60 were returned (see below). After a change in postal rates there was even less need for a twelve penny stamp and the undistributed inventory of 49,490 were destroyed on or about May 1, 1857. 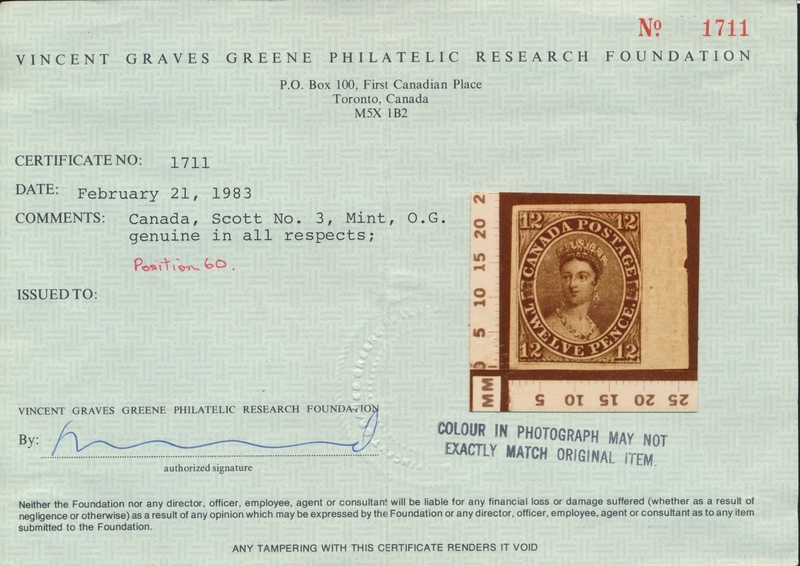 The Marquis of Lorne served as Governor General 1878-83 and apparently informed Canadian Officials that his travels and other duties had severely depleted his financial resources. There is no record of any payment but for several decades after he left Canada, the Marquis (later Duke of Argyll) discreetly met with Charles Phillips of Stanley Gibbons. Following the meetings, Phillips would be able to offer up to five mint, nice quality twelve penny blacks to his clientele for a thousand pounds each. 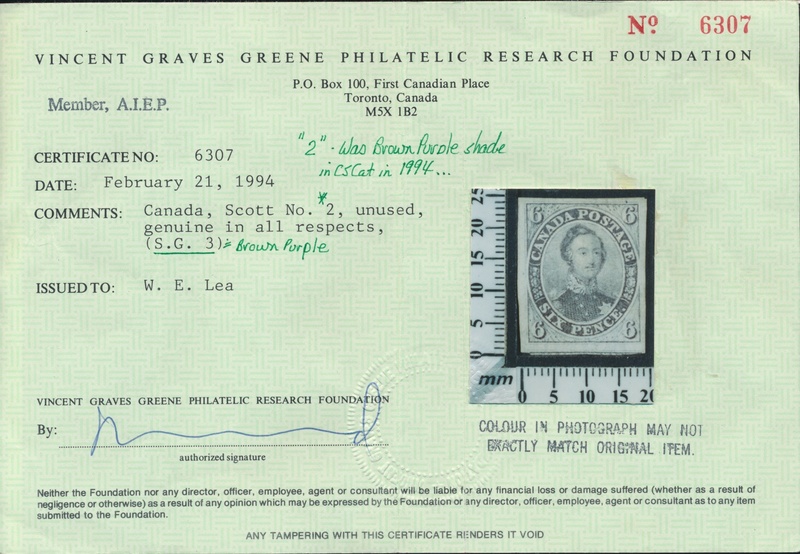 It is interesting to note that late in the nineteenth century a thousand pounds would buy a respectable house and even today the value of a twelve penny black will buy a house in many parts of Canada. At any rate, the arrangement between Phillips and The Marquis is an important one, in that it now means that stamp collectors have at least several dozen very nice quality stamps of the desirable twelve penny black to chose from. It might be decades before the next opportunity to buy all three of the mint laid paper stamps in this quality comes up. It was our privilege to offer these gems from the Outaouais Collection as the first three lots of Sale #25. 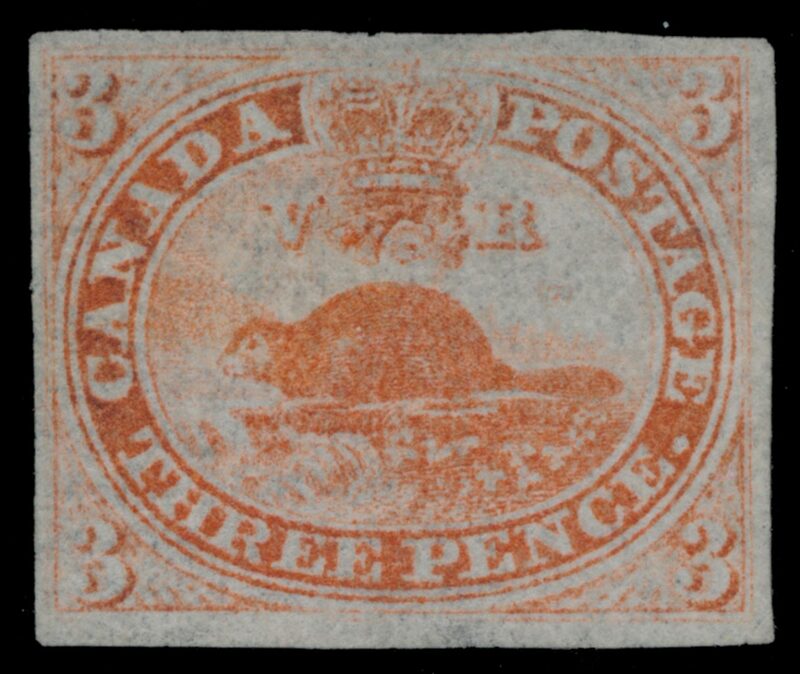 Lot 1 Canada #1a 1851 3d orange red Beaver Imperforate on Laid Paper. 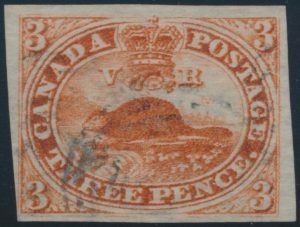 Canada’s first stamp, a three penny value paying the domestic rate and showing a beaver, was engraved by Alfred Jones using a very similar design proposed by (later Sir) Sanford Fleming. One census of unused mint laid paper three penny beavers put the number at eighteen. Although this might be a little bit low, unfortunately many of these are cut into or have faults and some are in institutional collections. It is likely that fewer than a handful of very fine four-margin number ones are in private collections. This stamp has two Certificates of Authenticity: A 1985 V.G. 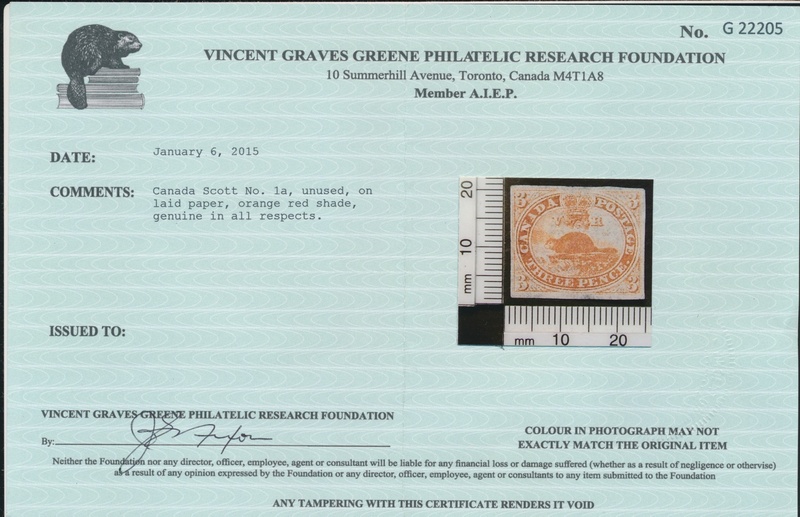 Greene Foundation certificate states “…Mint, O.G., genuine…” and a 2015 Greene Foundation Certificate states … “#1a, unused, on laid paper, orange red shade, genuine in all respects.” It is unclear to us what happened to the gum after 1985 but assume that the authenticity of the “original gum” was questioned and a previous owner soaked off the gum. For the record there is a tiny faint crease entirely in the lower right margin which was not mentioned in either certificate; this could be literally cut away and there would still be four full large margins. 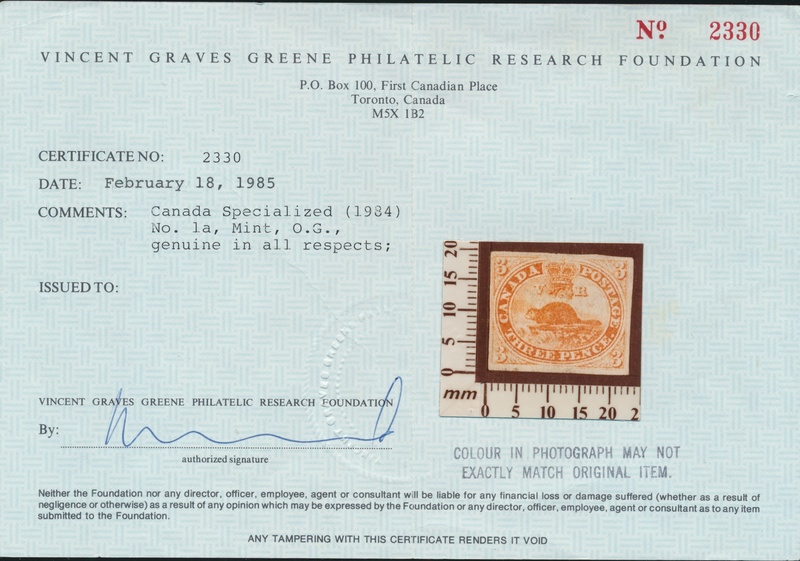 This stamp with fresh colour and full margins is a very rare example of a very fine Canada’s first stamp. Lot 2 Canada #2b 1851 6d brown purple Consort Imperforate on Laid Paper. 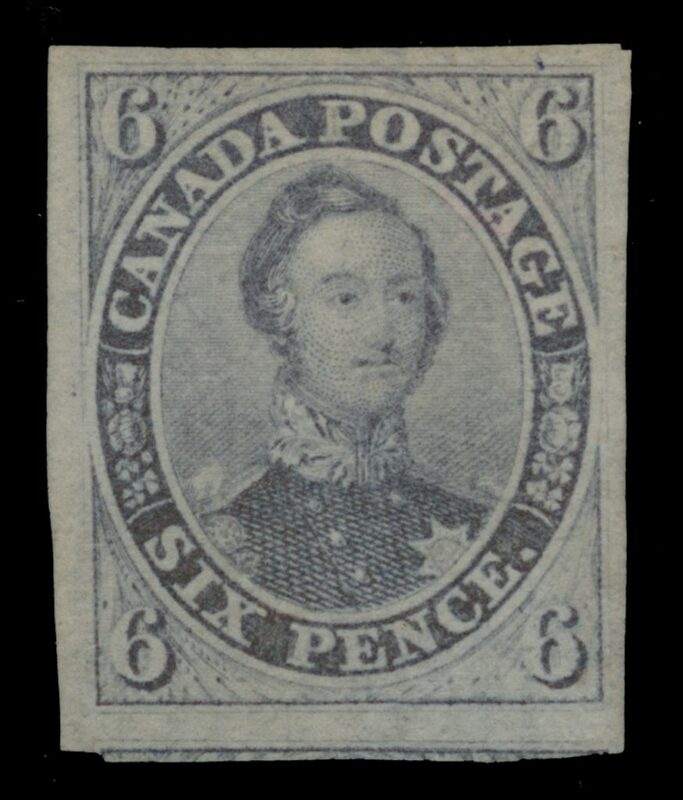 Canada’s second stamp, the six penny paying the rate to USA or double domestic, features Queen Victoria’s Consort Prince Albert and was engraved by Alfred Jones using several sources. This stamp is significantly scarcer in used condition than the beaver and also even rarer in unused condition than the three penny. 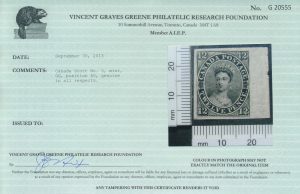 This stamp has two Certificates of Authenticity, both from the Greene Foundation. The first from 1994 and second from 2015 both state “…2b unused on laid paper, brown purple shade, genuine in all respects.” Neither Certificate mentions the droplet of printers’ ink in the upper right corner. 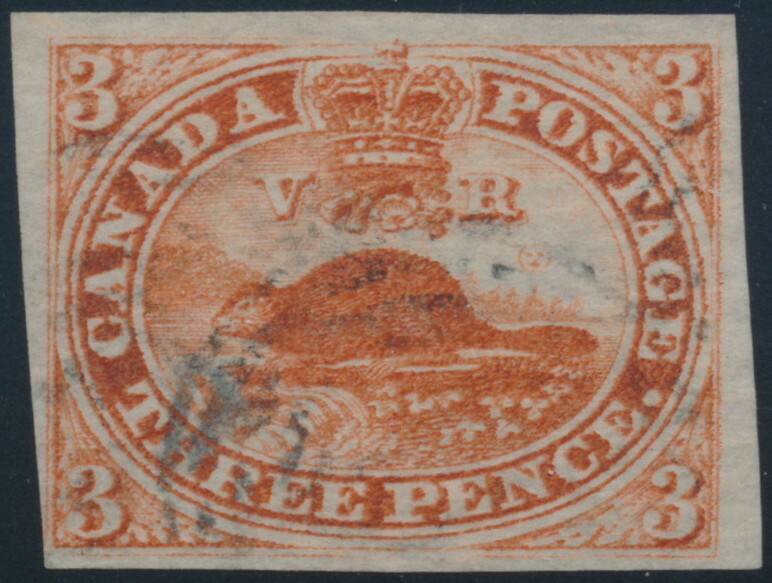 This stamp with deep fresh colour and full margins is a very rare example of a very fine Canada’s second stamp. 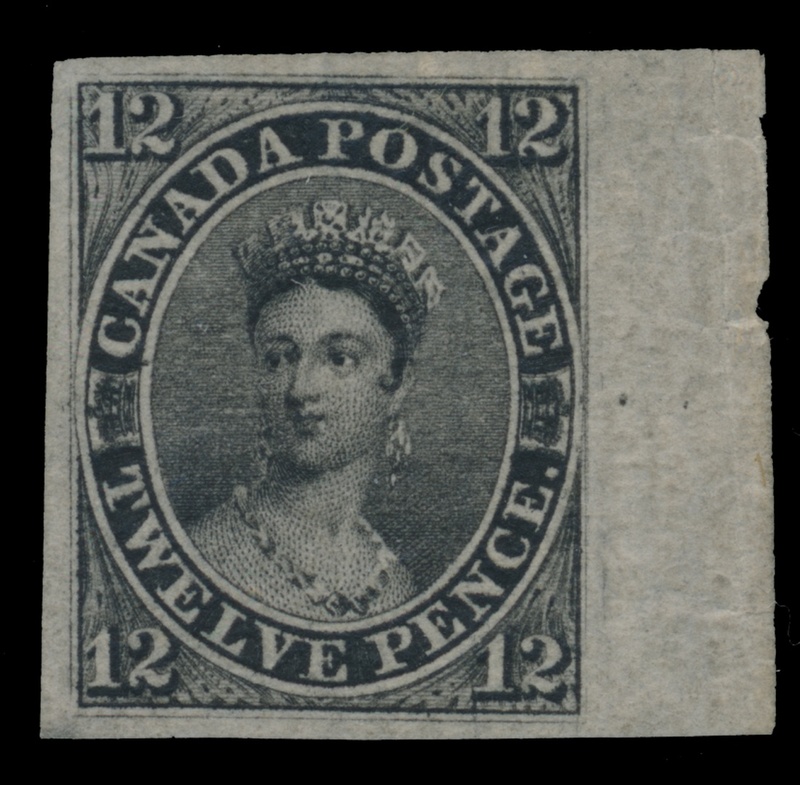 Lot 3 Canada #3 1851 12d black Queen Victoria Imperforate on Laid Paper. The twelve penny was recognized from the earliest days of philately as rare and desirable. The Chalon portrait was copied by Bahamas, Queensland, Tasmania, New Zealand, New Brunswick, Nova Scotia as well as other British Colonies. 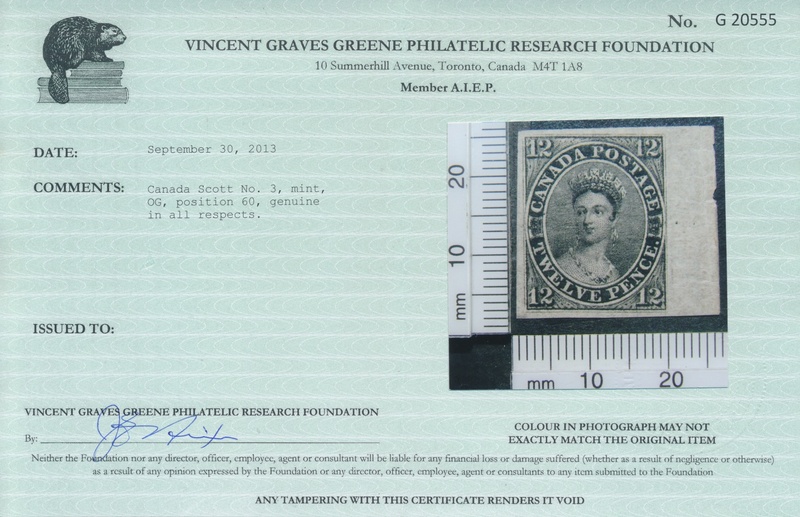 This stamp was sold by Charles Phillips and was owned by Charles Lathrop Pack as the top stamp in a vertical pair. It is position 60 within a plate of 100. The pair was sold at auction in 1944 and again in 1959 but by 1976 it had been separated and received a certificate from Herbert Bloch. With deep colour and a clear distinct impression, four large margins, full original gum lightly hinged, easily visible laid lines, fresh in all respects and a full sheet margin at right put this stamp in the first rank. Among the very fine mint twelve penny stamps, there are usually three which are regarded as being the most desirable. 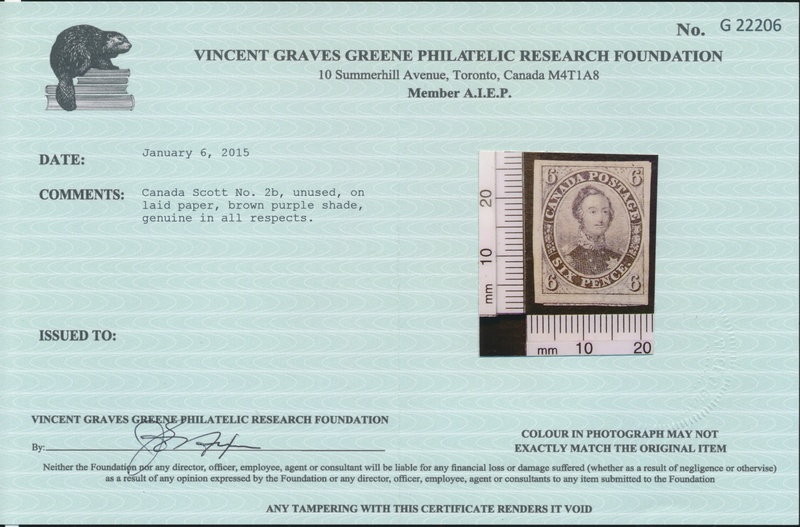 The full sheet margin of this gem compares favourably with another exceptional twelve penny, the Dale-Lichtenstein single from position 80 with an irregular sheet margin. As a result a number of advanced collectors confirm the opinion that the example from the Outaouais Collection is the most desirable and best of the best. 1944 Harmer, Rooke (New York) the “Charles Lathrop Pack Collection”, lot 26. 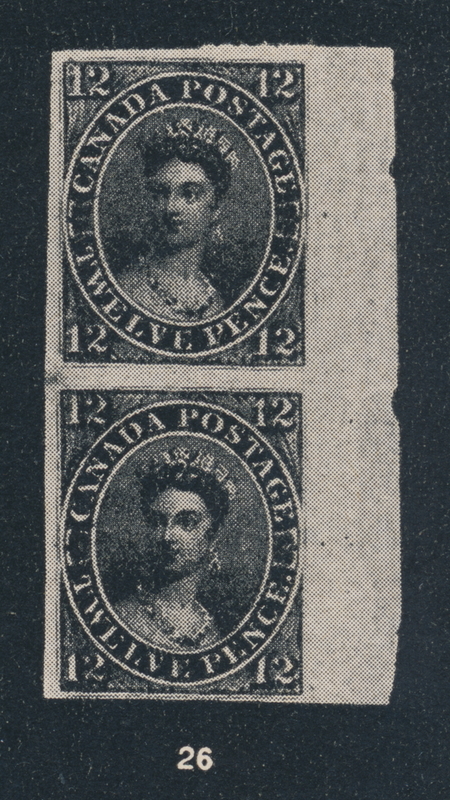 Pair (from which this is the top stamp). 1959 Robert Siegel Auctions Lot 27, Pair (from which this is the top stamp). 1977 Maresch & Son Private Treaty sale. 1983 Harmers of New York Inc. “The Provenance Collection of BNA”, Lot 2062. 1997 Maresch & Son Sale 322, lot 102. 2018 Sparks Auctions Sale 25, lot 3. The “Charles Lathrop Pack Pair” is illustrated (Plate IV) and discussed in the 1911 edition of Canada Its Postage Stamps and Postal Stationery by Clifton A. Howes B. Sc, FRPSL. Illustration courtesy of Harmer, Rooke & Co. “Charles Lathrop Pack Collection” catalogue, December 6-8, 1944, Lot 26.